•When slow cooking, always use meats that have some fat or will be a dry disaster. •Always brown the meat first to seal the juice in. This caramelization is key to making flavor-packed short ribs! •Don’t place cold meat in the slow cooker, use it to keep food warm. 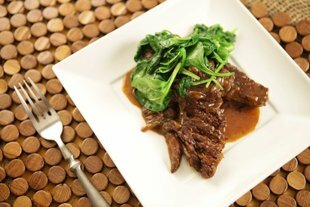 •Dark beer and cracked pepper bring out the caramels and deep flavors in short ribs. •Reducing beef stock helps concentrate the flavors in your slow cooker. A little goes a long way. Reduce the quart of beef stock to one cup in a shallow sauce pan or deep sauté pan and set aside. Season the short ribs with salt and pepper, and then dredge in flour until well coated. Cook the dredged ribs until browned on each side, about 5 minutes per side. When browned on both sides, remove the ribs from the skillet and set aside. Reserve pan drippings for later. To a slow cooker, add the onion as a bed, then add seared short ribs. Add as well any juice or drippings reserved from the pan. Cover the ribs with smashed garlic cloves, fresh herbs, butter, salt and fresh cracked pepper. Add the stout beer and reduced beef stock. Place the lid on the slow cooker and set to high. Cook for approximately 6 hours or until tender. Top short ribs with sauce made from cooking them. I think what we need to do is to try and make diets and exercise easier to stick to. Personally, I follow a Paleo diet and I love it. I lost a lot of weight, it helped my constant tiredness and I go through life with much more positivity. I want to recommend you an excellent Paleo cookbook. High for 6 hours? Is this correct? “Seal the juice in”? You actually believe this old wives tale? I am making these tonight!!! Smells good so far!! Beef….its what’s for dinner tonight! Going to make these today since they look absolutely amazing! What would go well with these as a side dish? Going to make these today since they look amazing! First time I made this I made doubled the recipe and then I froze the leftovers till the next weekend and made a vegetable beef soup with it. It was fantastic both times. Probably the best vegetable beef soup I have ever had. I am making it again this weekend. to “reduce the beef stock from 1 qt. to 1 cup. Please explain. Thank you. Will let you know how we liked this and I am sure it will be fantastic! reduce the beef stock on the stove from 1qt to 1cup……so flavor is more strong. Love, love these ribs. My husband said it was one his new favorite dishes. Easy to make. Made your meatballs too. Wonderful is all we can say! My family loves this recipe! I’m not a “crock pot queen” because it seems like most of the time no matter what I make, and no matter what spices I use, everything seems to come out with the same sort of generic crock pot taste. This recipe was different—and it’s definitely a keeper! The Dark Beer and Black Pepper Braised Short Ribs are AMAZING!!! So easy to make and they taste DELICIOUS!!! I made mashed potatoes for them, then turned some of the mashed potatoes into GNOCCHI. Not bad for an Irish woman!!!! I love short ribs and will save this recipe but won’t print it out because the dark maroon colour will use up too much of my ink. Could you please set your recipes up for just the recipe, your name and eliminate the background dark colours? Thank you from a Ukrainian who absolutely loves Italian food. Gerri, you can copy the text and paste it to wordpad and eliminate the problem of printing the backgrounds. I know Fabio has made several videos. One was on Short Ribs. Problem is I have searched your web site and can not find them. Neither can I find a link to them in some other archive. Can you help me here? Also, is there some way to stop the scrolling pictures on your home page. They just keep going around and are fery distraction and don’t add anything. If you want to keep them you should have a button so the reader can stop the scrolling and maybe allow them to bump up through the pictures at their own pace. That is if they want to.